NETWORK FINALS: CBS’s airing of FROSTY THE SNOWMAN gained 0.1 in final numbers, but HOW MURRAY SAVED CHRISTMAS and DATELINE each dropped 0.1 for NBC. 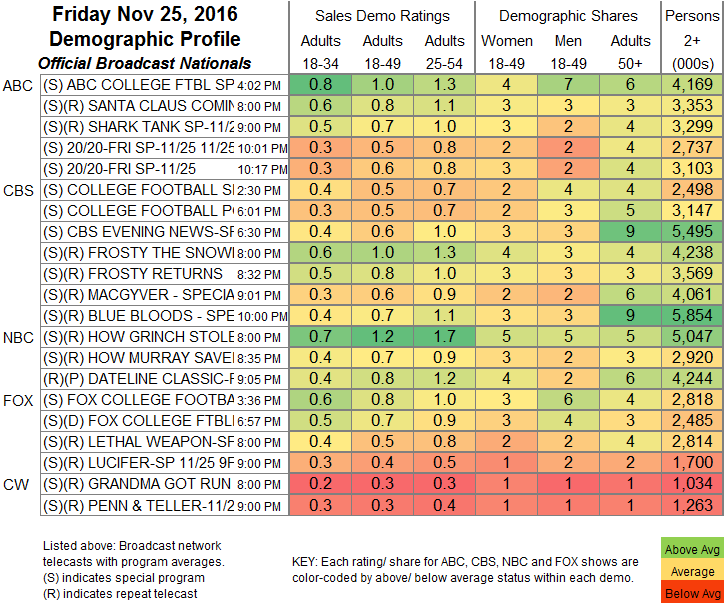 CABLE HIGHLIGHTS: The night after Thanksgiving was another lean evening for original cable programming. Discovery was dominant with a new episode of GOLD RUSH, down 0.06 from last week to 0.91, and lead-out TREASURE QUEST was down 0.07 to 0.40. Hallmark’s holiday movies continue to pay off with 0.62 for CHRISTMAS LIST. A trio of COLLEGE FOOTBALL games on ESPN were in the Top 10, topped by Arizona vs. Arizona State at 0.54, with Baylor vs. Texas Tech at 0.51 and NC State vs. North Carolina at 0.38. Nickelodeon’s LOUD HOUSE hit the Top 10 at 0.37. 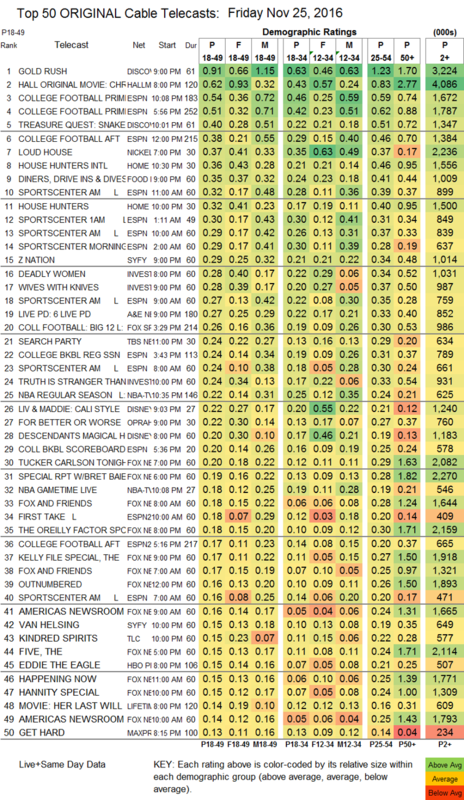 On HGTV, HOUSE HUNTERS INTL gained 0.05 to 0.36, and HOUSE HUNTERS ticked up to 0.32. Food Network’s DINERS, DRIVE-INS & DIVES rose 0.04 to 0.35. On Syfy, Z NATION jumped 0.09 to 0.29, but VAN HELSING only added a tick to 0.15. ID had a pair of 0.28s with DEADLY WOMEN and WIVES WITH KNIVES, and TRUTH IS STRANGER was at 0.24. TBS’s SEARCH PARTY had a huge 1.00 lead-in from a run of RETURN OF THE JEDI, which pushed the 11PM episode up to 0.24, but the season finale fell to 0.13 at 11:30PM. OWN’s FOR BETTER OR WORSE edged up 0.02 to 0.22. On TLC, KINDRED SPIRITS fell 0.05 to 0.15, and A HAUNTING was at 0.13, down a bit from last week’s 0.15/0.14.